No matter what happens before then, six weeks is still going to be a very long time for Philadelphia Eagles fans. There are some people who sadly view this as the end of a golden era. Others have champagne on ice already eager to toast a new year and a new regime (I myself have been waiting for this moment since November 24, 2008). After six consecutive losses leading to a 3-7 record (Including a 1-2 Division record and a 1-6 record in the NFC), it is safe to say that Andy Reid will not return for a 15th season as the Eagles head coach. Five NFC Championship games and one Super Bowl appearance is quite an accomplishment, but the constant decline over the past 3-4 years can no longer be ignored. I do not believe that Reid will or should be fired before the end of the season. Who are the Eagles going to name the interim coach? Marty Mornhinweg? Todd Bowles? Bobby April? After reading those names, six more weeks of Reid doesn’t sound too long does it? Once this dismal season ends, moving on from Reid should be the easy part for owner Jeffrey Lurie. What occurs following that will be a tedious task. After all, there will be two positions to fill: Head Coach and Vice President of Football Operations. Before anything else, Lurie must find a Head of Football Operations he can trust to have final say on decisions. Current General Manager Howie Roseman cannot be this person. Categorizing somebody as a ‘football guy’ is not the issue here. If you know the business and can make productive decisions, then great. Roseman deserves a lot of blame for the state of the Eagles as much as Reid. Because he played a role in this downfall, he should not be handed any additional responsibilities. To be honest, until I read an official report of his extension it’s hard to acknowledge that he received any sort of extension. Just like coaching, the search for the next VP of Operations or General Manger (whatever title they want to give, I really do not care) should begin with the organizations that have established a winning reputation and know how to build a contending roster. A popular name that is available is former Indianapolis Colts Vice President Bill Polian. Polian not only made the Colts perennial contenders the past decade, he also was the architect of Buffalo Bills teams that went to four straight Super Bowls in the early 1990s. In between those two stints, he had a brief one with the Carolina Panthers that included one NFC Championship appearance. Polian is a guy who would change whatever negative culture that seems to be lingering around the Nova Care Complex. The question is whether or not he wants to start with a new organization after 25 years in the NFL. Another choice could be San Francisco 49ers Director of Player Personnel Tom Gamble. A native of Haddonfield, NJ, Gamble’s first NFL position was with the Eagles from 1988-1994 when his father Harry was the president. Lurie should also look into New York Giants Director of College Scouting Marc Ross (native of Sharon Hill, PA) and Green Bay Packers Director of Pro Personnel Eliot Wolf (son of former GM Ron Wolf). Once a selection has been made on a Head of Football Operations, they should be allowed to decide whether or not they want Roseman around to assist with contract negotiations. If Lurie is truly committed to Roseman and charges him with football operations and selecting the next head coach, I am not confident in the Eagles being relevant for the next 4-5 years. Whoever is in charge of the head coaching search is going to have a few choices, but also a lot of competition. Of all the former head coaches who may be available, I have a very difficult time seeing Sean Payton leave New Orleans. Jon Gruden is already a hot commodity for both NFL and college teams. Although he’s won a Super Bowl, I’m not sure Philly is a good fit for him. His post 2002 record in addition to his history of relying heavily on seasoned veterans as opposed to developing younger players is a turnoff for me. Former champions Brian Billick and Bill Cowher wouldn’t be my top choices either. Outside of his Super Bowl season in 2000, Billick’s head coaching tenure in Baltimore was very mediocre with no playoff wins. Everyone knows how patiently Pittsburgh waited for Cowher to deliver. The college ranks may be a popular place to search for the Eagles next coach thanks to the success of Jim Harbaugh in San Francisco (It’s a bit early to use Greg Schiano as a prime example). 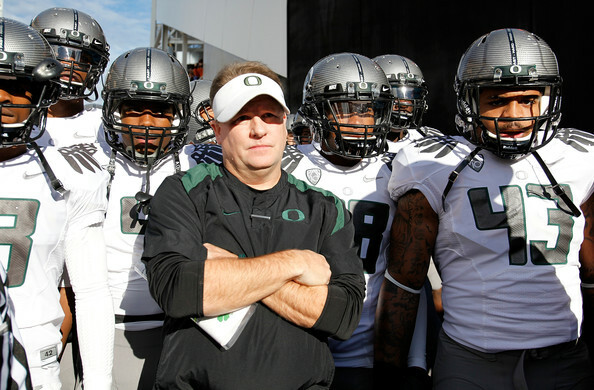 Oregon’s Chip Kelly is the hot name right now. Please!!! Not here!! He would bring a new gimmicky style that would be a continuation of Reid’s approach. Lurie’s track record suggests that an NFL assistant coach will be the likely choice. His first hire was Ray Rhodes after he helped the 49ers win their last Super Bowl. Andy Reid was a quarterbacks coach in Green Bay. Which direction would be chosen for the next ‘up and coming’ coach? If it’s time to switch back to defense, two choices could be Gus Bradley (Seattle Seahawks) or Vic Fangio (San Francisco). As seen with Houston Texans defensive coordinator Wade Phillips, not every assistant is meant to be the head man in charge. Sticking with the offensive side may be considered in quarterback driven league. Mike McCoy (Denver Broncos) was a candidate last year for the Miami Dolphins. He’ll receive his share of phone calls this offseason as will Atlanta’s coordinator Dirk Koetter. Lurie may select another quarterback coach such as New Orlean’s Joe Lombardi. The promotion of special team coordinators to head coach would be a very unpopular choice. Even Baltimore Raven’s John Harbaugh spent a year as a defensive backs coach before he was hired. That said, do not be surprised if it happens in 2013. San Francisco’s Brad Seely and Chicago’s Dave Toub both generated interest last offseason. Jeff Lurie’s decision making in January will let people know how competitive he is. The next head coach and head of football operations will only be as good as the staff they develop. At the moment I’m just excited about the possibility of a change. The other day Brian Billick stated that the Eagles will not find a better coach than Andy Reid. How many people felt an unknown quarterback coach would be better than Ray Rhodes at the time? Didn’t think it was that many. Here’s to a new era beginning in 2013!! How Attractive Are The Eagles For The Next Coach? What about Steve Spagnola, or one of the Assistant Coodinators for Green Bay or New England? Another persuading factor will be $$$$ offered. I want no part of the Belicheck coaching tree; the results of their past coaching records has been dismal…Ex: Romeo, Charlie, Eric etc. A new GM who comes with obvious credentials for building through the draft and decision-making is essential. There were some good suggestions in the article. Please, no Jon Gruden, Cowher, Billick, etc for HC!!! Please no coaching retreads. Gruden, Cowher, Billick,Holmgren and whoever else you want to through in. No College coaches either. I heard Jim Harbaugh’s name brought up as a college coach. People forget he spent 7 years in the NFL as an assistant besides playing QB. Mike MCoy is a good candidate. (OC at Denver). He has changed his offensive schemes two years in a row. Running game under Tebow last year and passing this year with Peyton. It will be their 2nd consecutive AFC West title too. Ray Horton at Arizona(DC) is a good candidate, who if Reid would have hired him a few years back when after he fired Mc Dermott maybe he wouldn’t be on the verge of losing his job now. Whatever, a up coming assistant is my choice. Bring in Greg Williams as head coach to pick his defensive coaches and get his brand of nasty players on this defense. The soft attitude must be erased first. Get Green Bay’s QB coach to run the offense and pick his offensive coaches under him. That takes care of the coaching position. Move Roseman to cheif accountant and hire the head of San Fran’s scouting team as GM. Put these elements together to map out the path going forward for our Eagles. First big move is to trade our 3rd pick in the draft DRC for QB Matt Flynn. Move Boykin to the outside. Get Eric Reid for the first pick in the draft to solve our Safety problem once and for all. Pick up the other Safety as a free agent. Cut Nate Allen…..he was not worth a 2nd round pick and have not shown he’s worth keeping. He’s soft and stay injured…that’s what we know of Nate Allen. Keep Kurt Coleman for special teams….he’ll excel there and would be an good backup if one of the starting safeties go down. Slide Marsh to the Nickle corner and start Brandon Hughes opposite Asomugha. I believe with good safety play Asmo game will get back to his old self. As for the Brass…..Lurie need to surround himself with fresh people with no connections to the old regime. Howie will deal with cap management only and will have no say in picking talent. “0” say…he check for what his coaches need and get the players the Coach on defense and the coach on offense gives him. period. We will change the culture of this team. No trading out of the Early picks to stockpile low paid, low talent bums. If this happens….Go Eagles 2013!!!!!!! Your right paulman there will be other openings but everyone knows that Philly is the best opportunity especially since we are the best fans in the league! You know what’s really wrong hurt the fans of the Eagles today? We all seen this coming years in advance but was told the Eagles coaches knew more than us. Wasted years when the team had the nucleus to win it all. The Eagles PR sold us being competitive was being was success, and because they were now competitive and so ahead of other teams, they could then trade away first round picks and let the leaders of the locker room walk away. This Eagles brass from Lurie down let a potential team that could have won at least 2 Superbowls go to waste. I don’t know if Lurie’s the owner that can turn this around if him being so close to this did not see the downward spiral coming. If he keep Roseman at the GM position that will tell the fan base he have no intention of turning this thing around. A complete overhaul is the only way to get this fan base on board. they Hired Howie Roseman for the GM job now it is his job to fail or succeed—- I don’t want a bunch of voices preventing us fans from identifying who screws up draft choices — ( was it Reid, Banner, Roseman, or Heckert) Howie is the man and that is fine but no VP of Personal just have one man in charge of the roster and Head Coach hire if Howie fails we will see it like we see that Graham, Allen, Watkins, Jarrett and Kendricks can’t play and Cox can. He has already failed. You listed only half the players the Roseman/Reid regime selected. I will hold out on Cox and Kendricks. They are just rookies. Everyone else has been here for at least two years. Time to sweep out the penthouse. Somebody mentioned Matt Flynn at QB … Are you serious. He got beat out by a rookie QB…and he was the top guy coming in camp… My choice for coach… Bill O’Brien, what he has done at Penn State has been amazing. And I like his offense.